"'The Dalles and Sandy Wagon Road', Oregon"
The Dalles and Sandy Wagon Road was the forerunner to the Historic Columbia River Highway. "In 1872 the State of Oregon built the first continuous road through the gorge from Sandy to The Dalles. 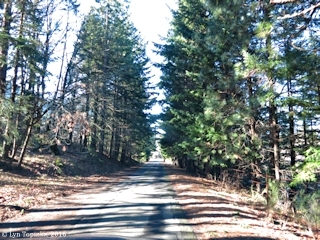 This wagon road was known for its sharp turns and very steep grades. Much of this route was destroyed with the Oregon Railway and Navigation Company constructed a water-level track through the gorge in 1882-83. In spite of several subsequent attempts at road-building, steamboat and rail remained the main mode of transport through the gorge until the construction of the Columbia River Highway." Source: Oregon State Department of Transportation, 2010, "Cultural Landscape Inventory, Historic Columbia River Highway: Shellrock Mountain to Ruthton Point". "The first wagon road in the Gorge ran from the town of Bonneville to the site of the future Cascade Locks -- a distance of six miles -- and was completed in 1856. It climbed to an elevation of over 400 feet on steep grades around a portage at the Cascades of the Columbia River. This road only ran a short distance, however, and met the needs of a select few. Journeys on it, carrying supplies from Fort Vancouver to men stationed east of the Cascade Mountains, proved onerous. By 1872, the Oregon legislature designated $50,000 for building a wagon road from the mouth of the Sandy River, 18 miles east of Portland, through the Gorge to The Dalles. The road money was soon expended and four years later another $50,000 was appropriated. Even though the road was completed, travel on it proved difficult. The alignment was crooked and narrow with heavy grades, often exeeeding 20 percent. "The Dalles-to-Sandy Wagon Road" was never really practicable for travel. "On January 24, 1856, legislation establishing a territorial road from the Sandy River (Troutdale) to The Dalles passed. Construction commenced on a wagon road between Bonneville (the lower Cascades) and Cascade Locks (the upper Cascades) almost immediately. The following year, legislation passed authorizing the construction of a wagon road and bridge across Eagle Creek. In 1863, a trail for pack trains and cattle opened on the Oregon side to serve as a route to the mines in the interior. In 1872, the Oregon Legislature appropriated $50,000 for the construction of a wagon road from the Sandy River through to The Dalles. Four years later, an additional $50,000 was appropriated for the project. The resulting wagon road was 12-feet wide, but it was both crooked and steep. Partially obliterated by the construction of the Oregon Washington Railroad and Navigation Company line in 1883, this military (or county) road also suffered extensively from the high water and flooding of 1894. Traces of this road were found by crews when the survey of the Columbia River Highway was completed in Hood River County during the winter of 1913-1914, and some masonry-walled sections are still visible above I-84 on Shellrock Mountain. (From "Tentative Dates Pertaining to Road Building in the Columbia Gorge, 1850-1960", by E. Walton, published in 1967). ..."
Source: Clarence E. Mershon, 2001, "East of the Sandy, The Columbia River Highway", Guardian Peaks, Inc., Portland. The Dalles and Sandy Wagon Road crossed the Sandy River at Troutdale. Built in the 1870s through funding from the Oregon Legislature, The Dalles-Sandy Wagon Road ran between the mouth of the Sandy River to The Dalles through the gorge. The wagon road crossed the Sandy River near where the wheel was found, according to a historic map of the trail. According to Hood River-based historian Sally Donovan, who wrote about the Sandy River Delta, homesteader Felix Hicklin claimed almost 325 acres along the eastside of the Sandy River in 1851. 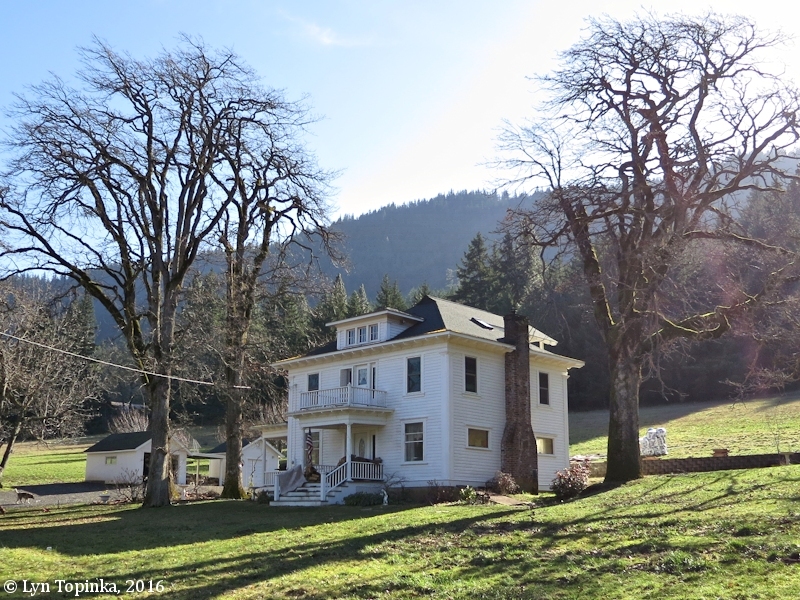 He eventually owned up to 1,100 acres on the eastside of the Sandy River around what is now Lewis & Clark State Park, running a dairy business until the family sold the ranch in 1908. Troutdale historian and Outlook columnist Sharon Nesbit wrote that a ferry was used to cross the Sandy River near the Lewis & Clark State Park boat ramp. The railroad was built and crossed the Hicklin land in 1882. Other ferries that crossed the Sandy River in that vicinity operated through 1912, when the Historic Columbia River Gorge Highway bridge was built. Gresham resident Bus Gibson, who has studied many of the mountain and historic trails in the area, said The Dalles-Sandy Wagon Road was very difficult, steep and treacherous for travelers to use. When settlers reached the Hicklin farm, they would have used a ferry to cross the river or “attempted to find a crossing besides the ferry,” he said. Gibson said wagon roads, routes and wagon tracks can still be found throughout the area, many of which lie within 60 feet of Interstate 84. Portions of The Dalles-Sandy Wagon Road can be found mostly in Hood River County near Cascade Locks, he said. “It’s possible (the wheel) might have come from an earlier wagon road at the river there,” he said. Source: Portland Tribune, August 27, 2011, "History Circles Back", by Calvin Hall, originally published in the "Gresham Outlook", August 26, 2011. 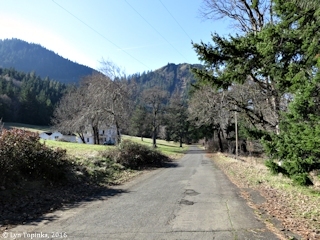 Latourell Road was once a section of the Dalles-Sandy Military Road. 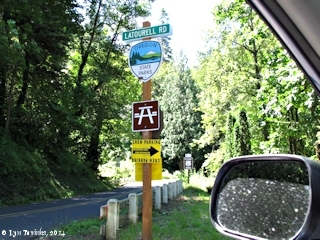 It then became part of the Multnomah County Road leading in to and out of the community of Latourell. Construction of the Columbia River Highway bypassed the community of Latourell. 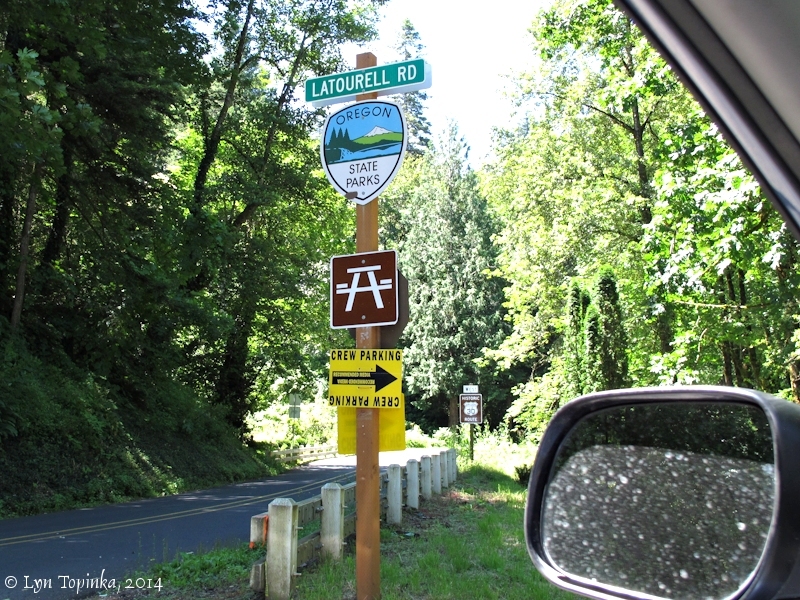 Click image to enlarge Latourell Road junction with the Historical Columbia River Highway, Latourell Falls, Oregon. Image taken June 30, 2014. 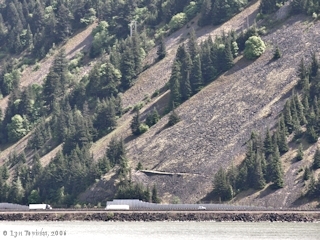 Click image to enlarge Mitchell Point Drive, view looking west, Historic Columbia River Highway, Oregon. Mitchell Point Drive was once the early The Dalles and Sandy Wagon Road. Image taken February 8, 2016. Click image to enlarge Mitchell Point Drive, view looking west, Historic Columbia River Highway, Oregon. Image taken February 8, 2016. The Locke/Galligan Home is located along Mitchell Point Drive, east of Mitchell Point. The first thing that Edgar did upon arriving at the new homestead was to build a small wood frame house to shelter his family through the harsh Gorge winters to come. The original house stood until 1908, when much of the wood was disassembled and used to build the prominent house that remains today. During the 1950s ... the Oregon State Highway Department purchased part of the property, the orchard, for the construction of the freeway. The property included a barn-like structure, which was moved to avaoid destruction. In later years, the same structure was moved [again] in order to place it on a strong foundation. It is the onlly building remaining from the first homestead." Source: Robert W. Hadlow and others, 2009, Historic Columbia River Highway Oral History Report, SR 500-261, Oregon Department of Transportation. Click image to enlarge Historic 1908 Locke home as seen from Mitchell Point Drive, Historic Columbia River Highway, Oregon. Image taken February 8, 2016. "This trail ran closely along the south bank of the Columbia River, and was used principally as a stock trail in earliest pioneer times. Over it Daniel Lee took cattle from Wascopam Mission (at The Dalles of the Columbia, March 22, 1838) to the Willamette Valley in the late 1830s. A poor wagon road was later built, but used little and with much difficulty. It was destroyed in construction of the railroad right of way." ??? no other publication I have found to date (June 2014) says that Daniel Lee's Cattle Trail was near the Columbia River. ... The first cattle to cross the Cascade mountains were fourteen in number, driven in 1838 from the Willamette over the trail north of Mt. Hood by Daniel Lee of The Dalles mission. Jason Lee in 1834 had brought a few cattle with him across the plains as far as Ft. Walla Walla, the present Wallula. ..."
With ten horses belonging to the Mission, and ten others owned by the natives, and provisions for six days, Lee set out on his undertaking. The trail proved worse than had anticipated, passing through ravines and across rapid streams, and often obstructed by fallen trees. Sometimes it lay along the margins of dangerous cliffs, and at the best was everywhere overgrown with underbrush. On the west side of the summit it was lost altogether under many generations of leaves. The six days' provisions were exhausted, and two of their horses, starving like themselves, were eaten before they had reached the Willamette, at the end of two weeks. ... the return journey was more easily accomplished. On the 5th of October, eight days from the Willamette, Lee arrived at the Dalles with fourteen head of cattle ..."
According to the Northwest Chapter of the Oregon-California Trails Association "Northwest Trails" newsletter (Winter, 2006), Daniel Lee's Cattle Trail went from The Dalles to Mosier, then to the Hood River Valley, on to Lost Lake and Bull Run (north of Mount Hood), Zigzag, Sandy, and then to Oregon City. From Waiilatpu [Whitman Mission, near Fort Walla Walla] the emigrants proceeded without accident to the Willamette Valley, which they reached on the 5th of October, some by Daniel Lee's cattle trail from The Dalles, and others by the trail on the north of the Columbia, swimming their cattle to the south side when opposite the mouth of Sandy River. ..."
The Barlow Road skipped following the Columbia River and instead headed south from The Dalles and went around the south side of Mount Hood before reaching Oregon City. In 1863 Joel Palmer (who, in 1845 helped hack out the Barlow Road for emigrants around the south side of Mount Hood) and A.P. Ankeny established a cattle trail on the south bank of the Columbia River from The Dalles to the mouth of the Sandy River and Troutdale. "... County road building facilities did not prove at all adequate to care for the traffic resulting from the gold rush in the 1860's. A proposal in 1861, for a pack-train trail between Portland and The Dalles lead to the incorporation at Portland, October 16, 1862, of the Columbia Road Company, with Joel Palmer as president. This company opened at toll trail to pack trains and cattle early in 1863. Ferries were operated at Sandy and Hood River (then called Dog River). 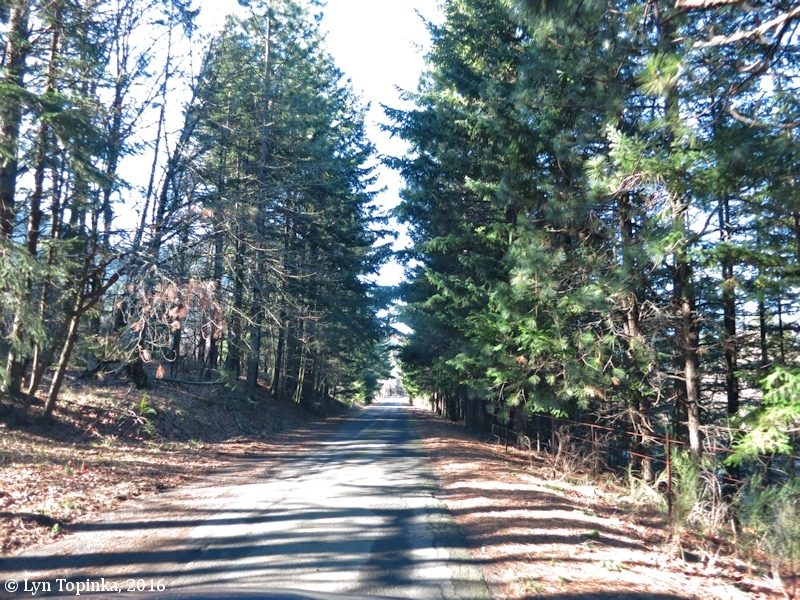 The section of The Dalles-Portland road east of Hood River was declared by Wasco County commissioners to be a public highway in 1867, thenceforth maintained by county funds. ..."
Source: Hood River News, Hood River, Oregon, May 28, 1943, information from "Oregon Historical Records Survey, No. 33". "... Joel Palmer, A.P. Ankeny and others opened a trail for pack trains and cattle through the gorge of the Columbia River on the Oregon side in 1863, as a route to the mines *. This was hardly equal to the present Columbia River Highway. The route included ferries at Sandy and Hood rivers. ..."
* John F. Miller made the surveys in 1862 (The Oregonian, November 10, 1862). The road was opened to cattle and pack trains early in 1863 (Ibid., March 21, 1863). The cost was $15,000 (ibid., December 9, 1864). Source: Scott, L.M., 1917, "The Pioneer Stimulus of Gold", Oregon Historical Quarterly, vol.18, no.3, September 1917. The 1867 "The Dalles to Boise Wagon Road" does not follow the Columbia River, but instead cuts inland through north central Oregon to reach Boise, Idaho. ??? I'm wondering - what was the relationship between Joel Palmer's cattle road and the "The Dalles and Sandy Wagon Road", especially during the three years Palmer's cattle road was a wagon road ... are they the same road ??? ... and what was the relationship of the ferries across the Hood River and the Sandy River to both roads ??? ... same ferries ??? "Oregon Railway and Navigation Company constructed a water-level railroad track from Portland to The Dalles. It was the only viable alternative to steamships for getting through the gorge." "Dedication of the Columbia River Highway (June 7, 1916) with ceremonies at Crown Point and Multnomah Falls. (Paving with Warrenite completed to Multnomah Falls at time of dedication.)" "Water-level freeway constructed to replace the HCRH."